Gauri Guha is an established and highly acclaimed professional North Indian classical vocalist and recipient of many grants from the Shastri Indo-Canadian Institute, the Ontario Arts Council and the Canada Council. She has eight albums to her credit. She is a senior disciple of Pandit A. Kanan and Mrs. Malabika Kanan. Currently, Gauri is studying music under the guidance of Pandit Ajoy Chakraborty. She achieved first class in Sangit Visharad (Bachelor in Music) degree from Bhatkhande Sangit Vidyapith in Lucknow, India. For the last 30 years, Gauri has performed internationally in many prestigious conferences and concerts and had been interviewed in the television, radio and print media in India, Canada, United States and the Caribbean Islands. In 1977, Gauri was sent by the Indian Council for Cultural Relations to the Cultural Centre, Guyana, South America, as a Cultural Officer/Music Teacher for three years. During that period, Gauri travelled extensively in Guyana, Trinidad, Barbados, Jamaica, Suriname and Venezuela. Gauri is a regular teacher at the Sangit Academy, Brussels, Belgium. In December 2006, she sang in a movie called "The Hindu Tomb" at Lille Festival, France. A CD was released during the festival. In July 2007, Gauri taught Indian music at a seminar in Neufchateau, Belgium, which is the biggest dance and music seminar of Europe. 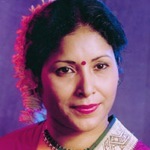 From 1997 to 2003, Gauri taught workshops and served as a board member of the Worlds of Music Toronto (WOMT) organization. Gauri has also taught music classes at M-DO, the Toronto Tabla Ensemble. Gauri also served on the panels of judges for Indo-Canadian Idol and Toronto Sanskriti Sanstha (TSS) musical competitions. In September 2007, she delivered a speech in "Spirituality in Music" and performed at the Toronto International Indo-Jazz Festival. Gauri is on the evaluation committee of the Shastri Indo-Canadian Institute, Calgary, Alberta. She has received felicitations from the Federation of Bangladeshi Association of North America (FOBANA), the Association of Women of India in Canada (AWIC) and BAPS-Swaminarayan Temple Ladies Group for her contributions in the field of music in Canada. In spite of Gauri's serious passion and total commitment towards music, she holds a Master degree in Literature, Business Management degree and a full-time senior management position in Scotiabank. Gauri is one of the registered members of the Speakers' Bureau of Dominion Institute Passages to Canada and regularly delivers motivational speeches in high and middle schools of the Toronto Board of Education. She also delivered speeches at the Revenue Canada and University of Toronto in the occasion of Asian Heritage Month Festival. Recently, Gauri was a guest speaker at the Sales Rally of Scotiabank.